ROBERT M. BALL began his career working in a local Social Security field office in 1939. By 1949 he had risen to a key position as Executive Staff Director of the important 1948-1949 Advisory Council on Social Security. The work of this Council led to the passage of the watershed 1950 Amendments to the Social Security Act, which, in the words of Bob Ball, "really saved the concept of contributory social insurance in this country." During the 1950s, Ball held important executive positions at the Social Security Administration (SSA), eventually being named Commissioner by President Kennedy in 1962. He served as SSA's Commissioner until 1973. Bob Ball in 1939, from his registration as a new SSA employee. SSA History Archives. 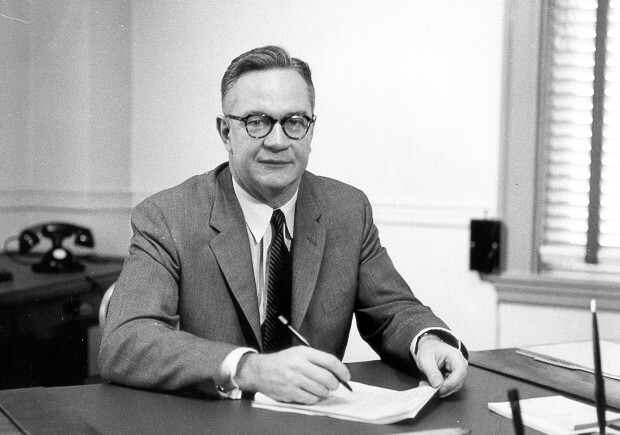 Ball in 1956 when he was the Deputy Director of the Bureau of Old Age and Survivors Insurance. SSA History Archives. Bob Ball during 1966 press conference. SSA History Archives. Bob Ball at his desk at SSA Headquarters, April 1962. 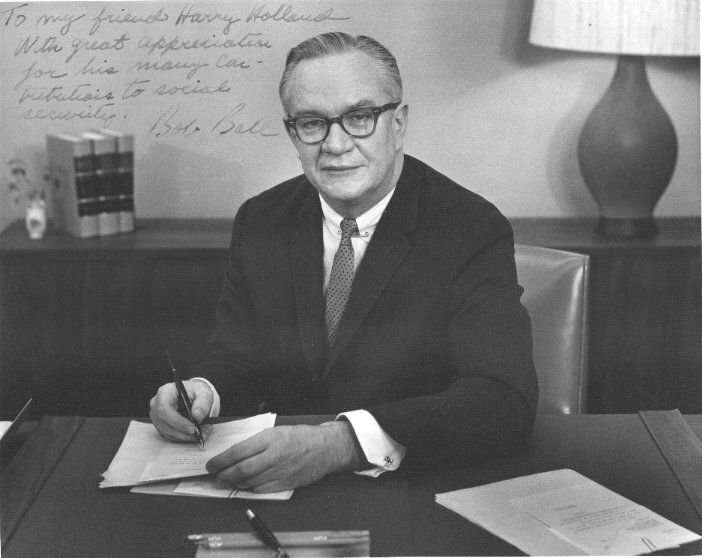 Photo is inscribed to Harry Holland who was a long-time field office manager. SSA History Archives. 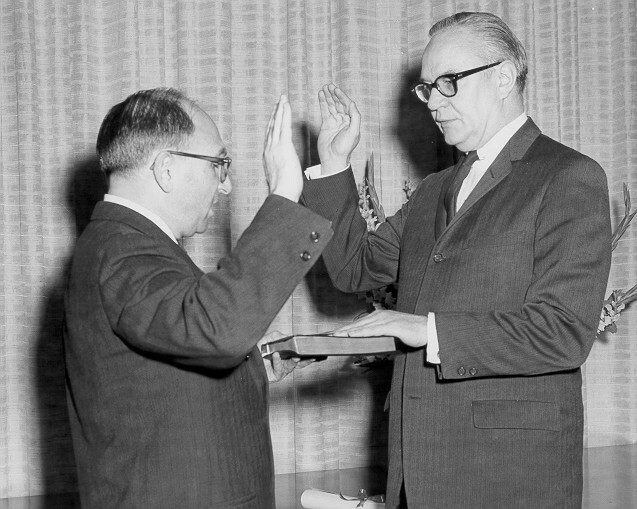 Robert M. Ball taking the oath of office as Commissioner of SSA, the oath is being administered by Wilbur Cohen who was at that time the Assistant Secretary for Legislation in the Department of HEW and a long-time friend of Ball's.-- 04/17/62. SSA History Archives. Following the swearing-in, Cohen congratulates Ball as Ball holds the formal appointment signed by President Kennedy. SSA History Archives. 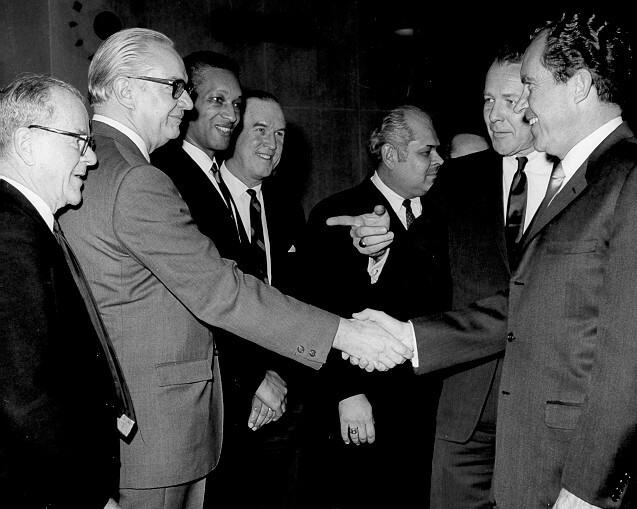 Ball meets President Nixon in February 1969. Also shown, left to right: Alanson Wilcox, Charles Johnson, James Kelly, Bernard Sisco and HEW Secretary Robert Finch. SSA History Archives. 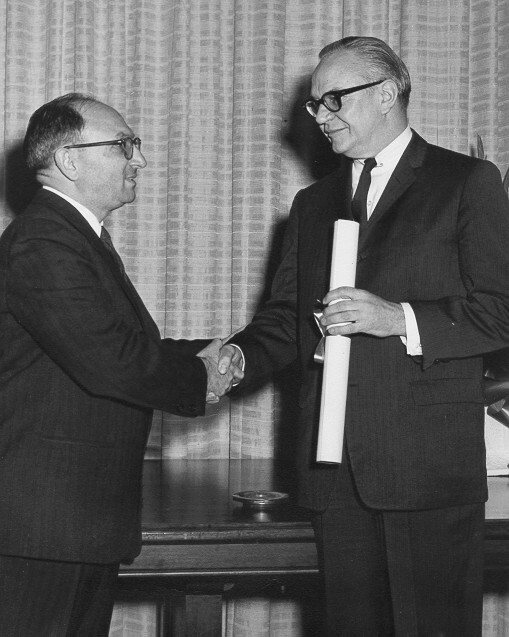 (Left to right) Arthur J. Altmeyer, Bob Ball and Wilbur Cohen at the White House in 1965. This single photo captures three of the most important figures in the history of Social Security in America. SSA History Archives. President Lyndon Johnson (right) Secretary of HEW John Gardner (second from left) and SSA Commissioner Bob Ball (left) received the first Medicare Part-B application form from a member of the general public, Mr. Tony Palcaorolla, of Baltimore, Maryland (next to President Johnson). Shortly after enactment of the legislation, SSA sent a mass mailing of application forms to all Social Security beneficiaries near or over age 65. Mr. Palcaorolla's completed and returned form was the symbolic first received from this mailing. September 1, 1965. SSA History Archives. 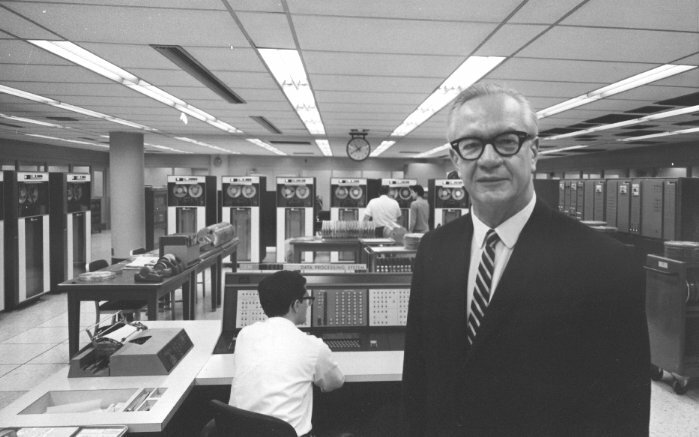 Ball in SSA's Computer Center in 1965. SSA History Archives. Ball with President Johnson and Wilbur Cohen (right) in 1965. SSA History Archives. 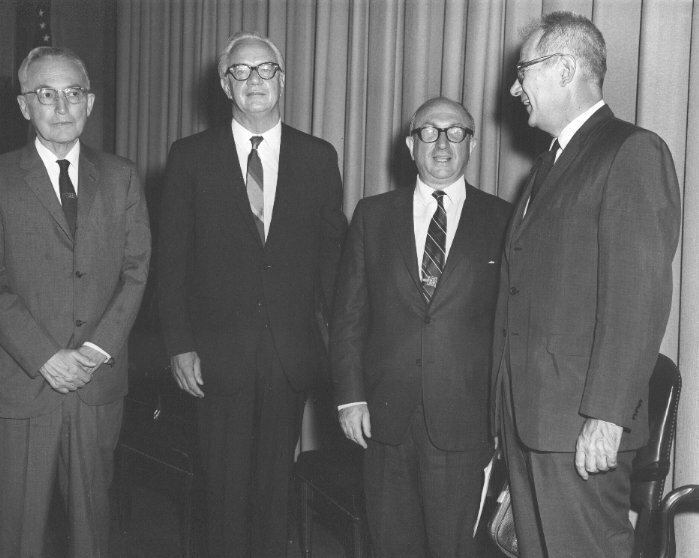 Left to right: Arthur Altmeyer, Bob Ball, Wilbur Cohen and Willard Wirtz in 1968 on the occasion of the 33rd anniversary of the Social Security Act. SSA History Archives. 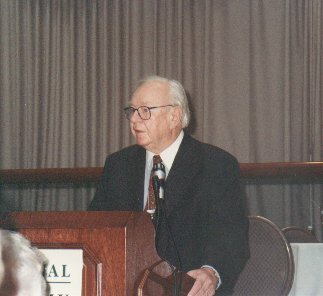 Bob Ball speaking at National Academy of Social Insurance reception, Washington, D.C., 5/16/96. SSA History Archives. Bob Ball speaking with Elizabeth Wickenden in the foreground. SSA History Archives. Mr. and Mrs. Ball, at NASI reception. SSA History Archives. 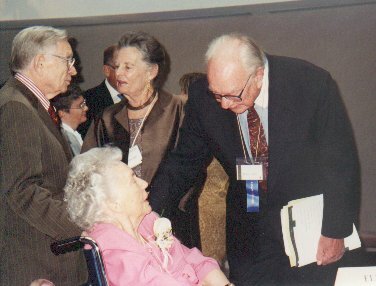 Mr. and Mrs. Ball talking with Elizabeth Wickenden and her husband Tex Goldschmidt, at NASI reception. SSA History Archives. 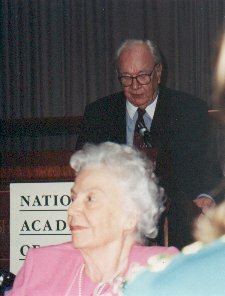 Robert J. Myers and Robert M. Ball at a National Academy of Social Insurance seminar on the history of Social Security. Washington, D.C. 11/5/97. SSA History Archives. During his tenure as Commissioner, Ball made extensive use of audio recordings of speeches and other public events (the first SSA Commissioner to do so). Thanks to this archive, which we have only recently been able to recover, we have a good sampling of Ball's speeches during his time as Commissioner. This speech was delivered before the Western Gerontological Conference at Fort Mason, in San Franciso, California on June 27, 1964. Bob Ball speech to SSA Region IX managers on April 19, 1965. This speech took place at the Sheraton Villa Motor Inn in San Mateo, California. He discusses in some detail the recently passed House version of the1965 Amendments, which would create the Medicare program and make many changes in the Social Security cash benefits programs. This speech was made prior to the Senate consideration of the bill and it signals SSA's views on the pending legislation. A key focus of Ball's remarks was the administrative challenges facing SSA in carrying out the Medicare legislation. This speech, delivered at SSA Headquarters in Baltimore on November 18, 1965, begins with an interesting historical overview of major organizational changes at the Social Security Admininstration through the years. 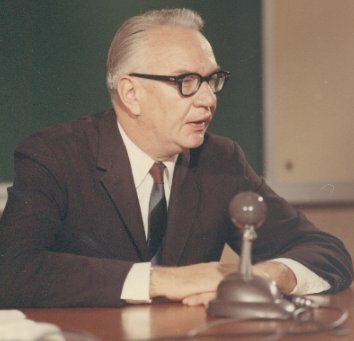 On July 7, 1966 Bob Ball addressed an assembly of SSA personnel at SSA Headquarters in Baltimore. The Medicare program had taken effect six days before and in this speech Ball recounts the administrative efforts required to implement the new program. This speech, from a September 22, 1967 seminar, expressed SSA's commitment to equal employment opportunity and Ball' strong personal feelings on the matter. This August 14, 1970 speech was delivered at the University of Michigan, Ann Arbor--on the 35th anniversary of the Social Security Act. On the afternoon of January 5th, 1973, Bob Ball spoke before the Commonwealth Club in San Francisco. Earlier that morning, President Nixon has informed Ball that he was accepting his resignation as Commissioner of Social Security. With amazing pluck and grace, Ball spoke that afternoon and presented what many believe to be one of the finest explications ever made of the traditional view of Social Security as a form of social insurance. Ball's deep convictions about Social Security and its future are evident both in his spoken remarks and in the question and answer period which followed. This speech is remarkable too for the degree to which the issues being discussed in 1973 are in many ways the same issues that are resonant today, more than a quarter century later. Speech before the National Organizations Conference--February 15, 1973. In this speech Ball explains in detail the many changes to Social Security and Medicare resulting from the 1972 Amendments. He also discusses the new SSI program. He also touches briefly on some of the same issues and themes from his Commonwealth Club speech.